When choosing a theme to feature, we try not to play favorites to any one particular ROM, so today we bring you NateModz. 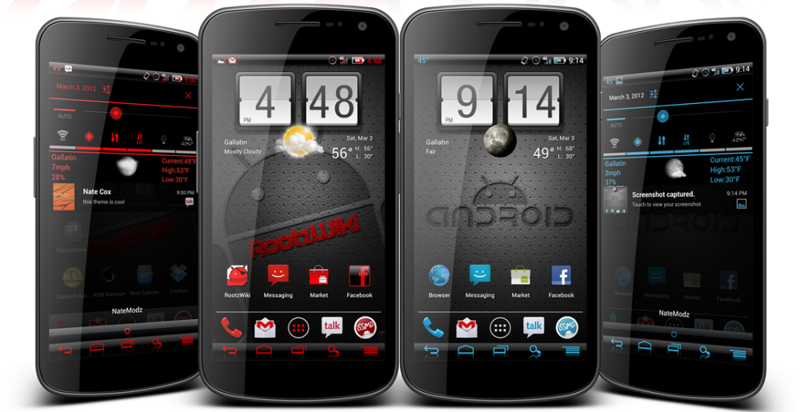 Both color choices (Red or ICS Blue) are compatible with a wide variety of custom ROMs such as AOKP, Liquid Smooth, Codename Android and BAMF. Along with the notification bar and navigation bar being themed a nice glossy tone that you can see, many system applications have also been themed such as Gmail, Talk, Dialer, and the Gallery. It’s a sweet theme if you like the more dark and dangerous look for your device. If you want to give it a go, follow the directions down below. Note: Due to there being many files for the different ROMs, please head over to the RootzWiki page to retrieve your zip file downloads. Download the zip file that matches up with the ROM you are running. Place the zip file on your phone’s storage. Locate theme zip file and install.